New Delhi, March 17, 2017: Citizens have given a clear mandate to BJP in UP elections. With clear majority, the BJP is all set to form the government and the citizens have some clear expectations from the incoming leadership of Uttar Pradesh. 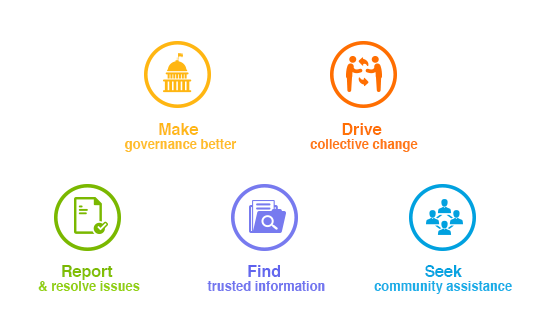 Citizen engagement platform LocalCircles ran various polls to figure out the citizen priorities from the new leadership. Improving Law/Order and Healthcare, Reducing Corruption, Creating Jobs are amongst the top asks from the Citizens. Over 20,000 citizens participated in these polls with 70% males and 30% females from across 25 different districts in the state. Citizens survey points out that the basic law & order and healthcare infrastructure in the state is broken. A large number 82% of the citizens who polled were concerned about their safety. Citizens want safety to be the primary responsibility of the new government. In a related poll, 48% citizens said the the incoming government should also enable transparent and accountable Police-Citizen connectivity and governance. Citizens pointed out that corruption in the state will have to be drastically reduced, with police and property registration being the two key areas with the highest amount of corruption in a separate poll. People want Government related transactions to be moved online, see new Government-Citizen interfaces created at department level and strengthen the anti-corruption/lokayukta machinery in the state. 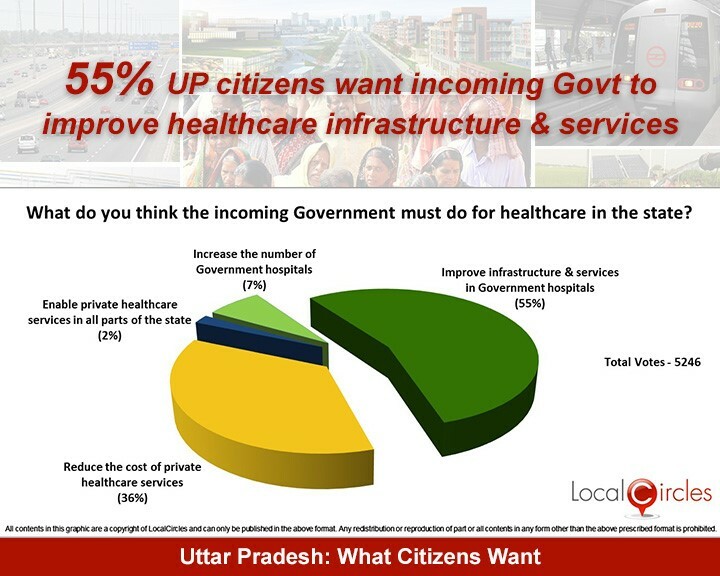 Citizens also said that public healthcare infrastructure needs much improvement in the state with 72% rating it currently as poor in a related poll. There have been numerous scams in healthcare in the past and 55% want the incoming government to improve the healthcare infrastructure and services in the government hospitals. Another 36% want Government to help reduce cost of private healthcare services. 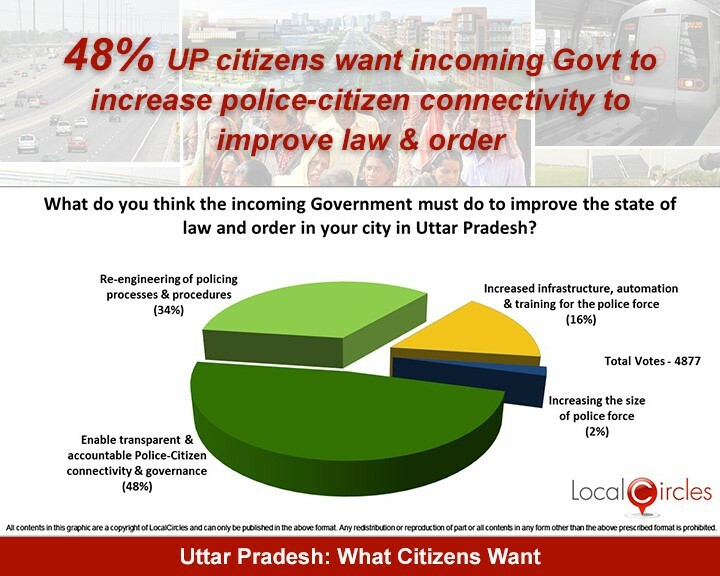 91% citizens of Uttar Pradesh see no or little job opportunties in the state at this time and want the new government to improve this situation. 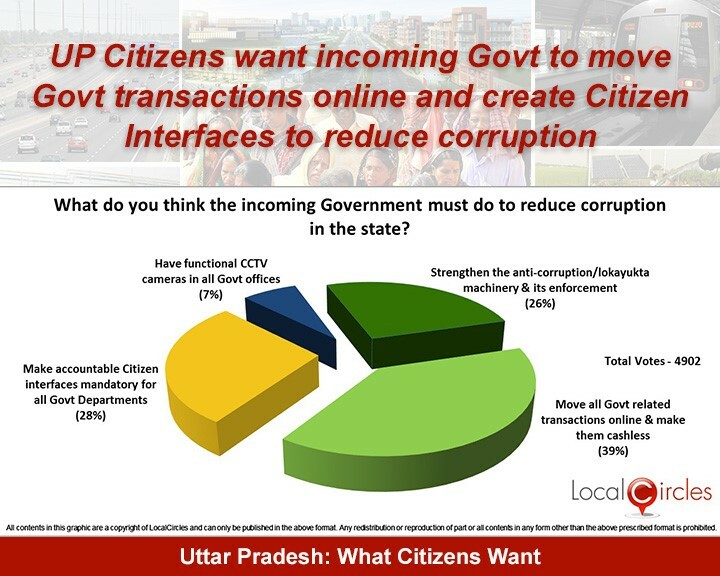 Due to the high corruption and ease of doing business being low in the state, more than 73% citizens who polled want the incoming government to cut red tapism and reduce corruption. 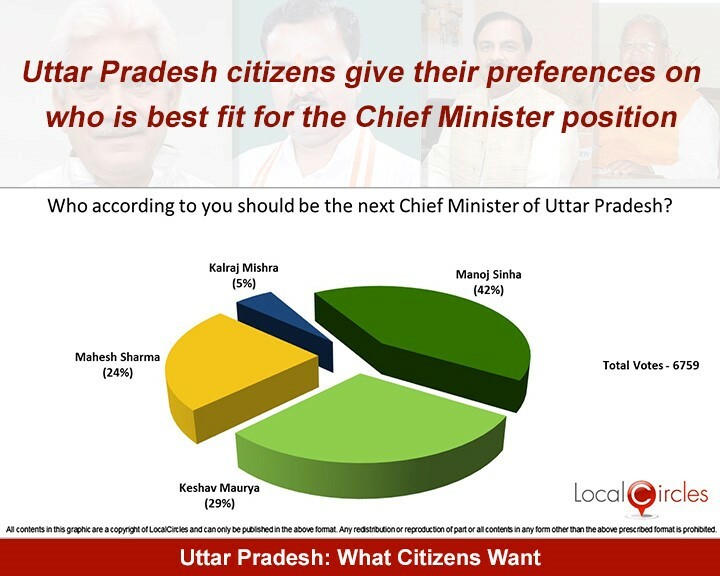 LocalCircles also conducted a poll on who is the leader best suited to govern the state as its Chief Minister. After 6,000 votes on this particular poll, 42% citizens want Manoj Sinha as the next Chief Minister, with 29% voting in favour of Keshav Maurya. Mahesh Sharma was close to Maurya with 24% and only 5% voted for Kalraj Mishra to be the CM. The poll choices were picked from citizen discussions itself based on the names that were repeating the most.